NASA's new ARISE mission is designed to measure sea ice and clouds in the Arctic to help scientists learn more about Earth's changing climate. NASA kicked off a new expedition at the top of the world this week to study melting sea ice in order to learn more about Earth's changing climate. The space agency's ARISE mission (short for Arctic Radiation IceBridge Sea and Ice Experiment) is designed to monitor conditions in the Arctic during flights scheduled from now until Oct. 1 — the peak of sea ice melt in the summer, according to NASA. Recently, scientists have noticed that the Arctic is losing more of its ice each summer, and the new mission should help them study how sea ice melt is affecting the planet's climate. Although 2014 doesn't mark a record low for sea ice in the Arctic it still counts as one of the lowest years on record, according to NASA cryospheric program manager Tom Wagner. "The simple fact is this: Since the 1980s, we've lost about two-thirds of our ice from the Arctic," Wagner told Space.com in an Arctic ice video interview. The ARISE fleet of scientific instruments is flown through, above and below clouds by a huge C-130 plane tricked out to make room for the instrumentation. The plane has holes in it that allow for the placement of lasers, radiometers to measure radiation and other technology to measure the thickness of sea ice, Wagner said. The mission was also put together on a very short time scale. It only took seven months to get everything ready for flight. "One of the biggest challenges with this new ARISE mission was pulling together all the mission objectives, the logistics, the aircraft, the data products, where we're going to deploy to in less than seven months, which is typically unheard of," Christy Hansen, ARISE project manager said in a NASA video describing the mission. "You usually have over a year to do all of that stuff." NASA has a fleet of satellites and other ground instruments that monitor Earth to keep track of changes happening on the planet. Although the satellite images help, ARISE will give scientists much-needed information about how clouds can affect global climate change. 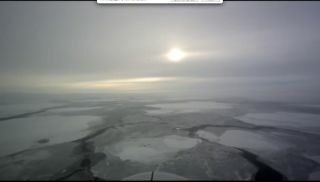 "A wild card in what's happening in the Arctic is clouds and how changes in clouds, due to changing sea-ice conditions, enhance or offset warming," Bill Smith, ARISE principal investigator said in a statement.